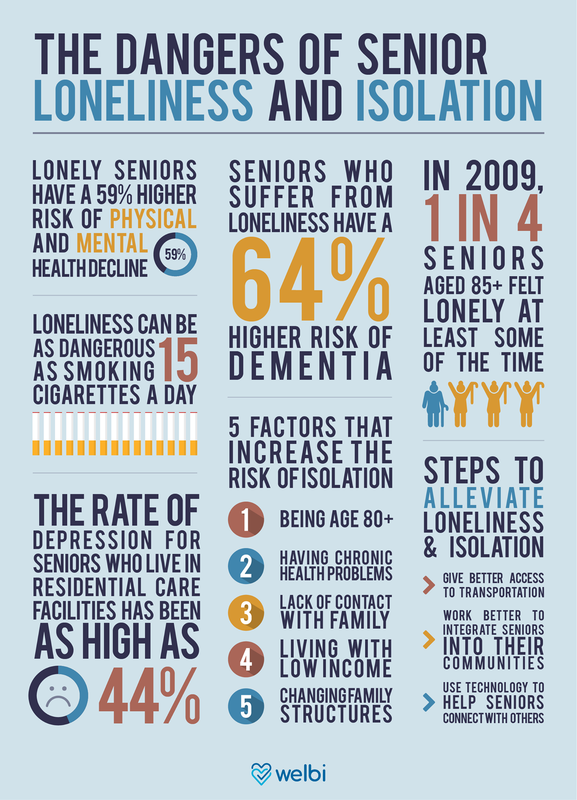 Infographic on the dangers of senior loneliness and isolation. Loneliness kills. For seniors, loneliness can be as large of a health risk as obesity, smoking, or alcoholism. Senior loneliness and isolation are not issues that should be ignored or taken lightly. A Statistics Canada study from 2009 showed that around 20% of seniors aged 65 and older felt lonely at least some of the time. For seniors aged 85 and older, this figure was 25%. This is a problem that gets worse with age, and it can have major negative consequences. Loneliness and isolation not only pose major threats to the physical health of seniors, but can have severe effects on mental health as well. A distinction should be made between loneliness and isolation, as they are not the same. A study by McMaster University defines isolation as a state that arises from having too few or no social relationships. This is contrasted with loneliness, which is the subjective perception of having insufficient social relationships or not enough contact with people. The two are related but distinct. It’s possible for seniors to be isolated and not feel lonely (and vice versa), which the study touches on in more detail. The fact that these two issues are separate could mean that they affect seniors differently, but more research is necessary to make a conclusion on this. The loneliness and isolation that seniors experience is usually a result of low-quality social relationships or a lack of these relationships entirely. However, there are other risk factors that may make them more susceptible to these issues. A major risk factor for developing loneliness and isolation is living alone. Seniors that don’t live with a spouse or other family member are much more likely to develop feelings of loneliness. In 2011, Statistics Canada found that 31.5% of women and 16% of men over the age of 65 live alone. However, even those who don’t live alone are susceptible to loneliness. A study done by the University of California, San Francisco found that 43% of seniors felt lonely even though only 18% lived alone. Many sources identify a lack of transportation as being another risk. As seniors get older, they will eventually lose the ability to drive, and losing this freedom can be hard to accept. Some seniors also avoid walking in their community due to low walkability or fear of falling. If seniors are unable to drive and hesitant to walk, they may be reluctant to try other transportation options, especially if they don’t know how to access them. This can easily exacerbate isolation if the seniors don’t have family members with cars who live nearby. life transitions (death of a family member, move to long-term care facilities, loss of driver’s licence, etc.). The report also identified groups that are at greater risk of social isolation. These groups include low-income seniors, seniors who are caregivers to others, Aboriginal seniors, seniors who are new to Canada or immigrants, and LGBT seniors. Seniors with physical and mental health issues are also at risk, which can be a major problem as loneliness can intensify these health problems even more. The effects of isolation and loneliness can have severe negative impacts on the health of seniors. One study found that lonely seniors have a 59% higher risk of physical and mental health decline, and a 45% greater risk of death. Other researchers have suggested that loneliness can be as dangerous as smoking 15 cigarettes a day or being an alcoholic. Physical health can be affected by loneliness in a number of ways. Isolated seniors are more prone to serious illnesses like chronic lung disease, arthritis, and impaired mobility. Feelings of loneliness can cause seniors to engage in other unhealthy behaviours, such as overconsumption of alcohol, excess eating, and smoking, as a way of coping with the loneliness. Loneliness can also cause seniors to spend more time indoors, and avoid physical activity. This lack of exercise can lead to increased rates of high blood pressure, heart disease, and other issues. Multiple studies have found that loneliness can affect heart health in significant ways. Researchers in Sweden found that coronary bypass patients who described themselves as lonely were 2.6 times more likely to die within 30 days after surgery than non-lonely patients. Additionally, even 5 years after the surgery, the risk of death for lonely patients was still 1.8 times higher. Loneliness and isolation can have major effects on mental health as well. A Dutch study found that seniors who suffer from loneliness have a 64% higher risk of dementia. Depression is also very common in lonely seniors. Among seniors who live in residential care facilities, the rate of depression has been shown to be as high as 44%. This is especially relevant, as seniors who live in these facilities are estimated to have much higher rates of loneliness than seniors who continue living in their communities. There are a number of steps that can be taken to try to alleviate the loneliness and isolation that seniors face. Some of these include providing better access to transportation, working to better integrate seniors into their communities, and using technology to help them connect with others. For more details on potential solutions and other ideas on how to address senior loneliness and isolation, check out this article.